Contactez-nous et dîtes-nous ce dont vous avez besoin ! Nous serons heureux de vous aider. 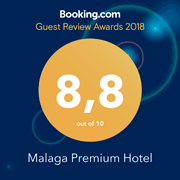 Malaga Premium Hotel is conveniently situated in the heart of Malaga, so you will find us easily no matter the means of transport you use: train, car, plane or bus. Our gastronomic hotel has an exceptional location, very close to everything you need. From the train station María Zambrano, you can take a taxi (10 min) or take a bus (14 min) to the hotel, and if you travel light, you can even go on foot (18 min). Near to the train station you will find many combinations to get to our hotel by bus. For example, you can walk northwest to calle Mendívil, few steps away from the station, turn right on calle Roger de Flor and then turn left on Paseo de los Tilos (Plaza de la Solidaridad). Take line 4 to Paseo del Parque, which is a 6-minute journey (3 stops). Get off at stop 468, Avda. de Andalucía (Correos). Go west to Alameda Principal, turn right on calle Córdoba and continue towards calle Puerta del Mar. You’ll get to Plaza de Félix Saenz and you will find us next to the Church of San Juan, in just a 3-minute walk. Find the bus combination that suits you best by accessing the Schedule Explorer of Google Maps. In case you want to stretch your legs, it is an 18-minute walking (1,4 km). Click here to plan your route step by step in Google Maps. See you soon at the hotel! Malaga Airport is very well connected. You can choose between a range of options to arrive quickly to the city centre. The fastest one is to take a taxi (which will cost you what the taximeter marks plus a 5 EUR supplement). Although you can take also the train or the bus and arrive also quickly at your destination. If you want to go by bus, you can take line A which connects the airport with the centre of Malaga (3 EUR, Terminal T3, Arrivals) and get off at stop 1956, Avda. de Andalucía (Correos). It is a 11-stop journey (30 min). From that point on, you have to follow again the instructions given in the second paragraph (From the train station) to get to the hotel on foot. If you come by train, take line C1 (Renfe Cercanías) from Terminal T3 (outdoor arrivals square) and get off at Malaga-Centro Alameda station. Walk to the Alameda Principal (South), which is about 300 m away from the hotel (4 min on foot). Go northwest on calle Talavera towards Alameda Principal, turn left on Alameda Principal and then right on calle Córdoba. Continue along calle Puerta del Mar and you will be in a few steps in la Plaza de Félix Saenz, where you will find us next to the Church of San Juan. Here you are in Malaga’s heart! The Malaga bus station is located just a few minutes away from the train station and closer to our hotel. You can get there in about 10-minute walk. At the station gate, there is both a taxi stop and a bus stop. Both options will take you 10 minutes. At the exit of the station is the Paseo de los Tilos (Plaza de la Solidaridad). To go from here to the hotel just follow the instructions in the section above. If you travel light and you would prefer to go walking (19 min. ), go to this Google Maps link and check your route details. You are closer to enjoy one of the best Malaga terraces and its views of the city. If you go by car, you’d better take the motorway to Av. Santiago Ramon y Cajal/A-45 instead of going to the centre. There are many pedestrian streets and you can get lost easily. Get to the Paseo Martiricos and continue towards calle Armengual de la Mota and calle Hilera, until you get to the Parking Camas, 2 minutes away from the hotel. To get to the parking, go to Pasaje Marqués de Villafiel. Remember that our boutique hotel has an agreement with the Parking Camas with special prices for our guests. You can always try to park in the centre, although it is not always easy.